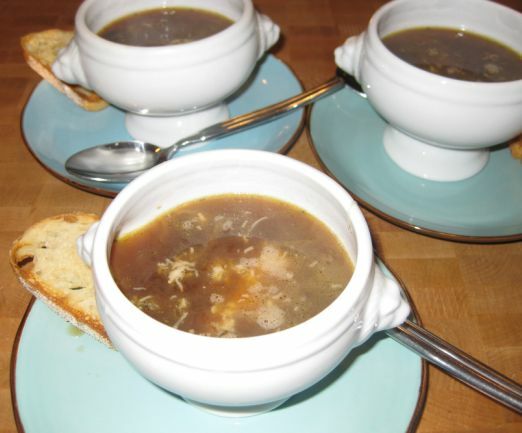 French onion soup is made with caramelized onion cooked in a beef broth that is traditionally served with croutons and cheese as toppings. 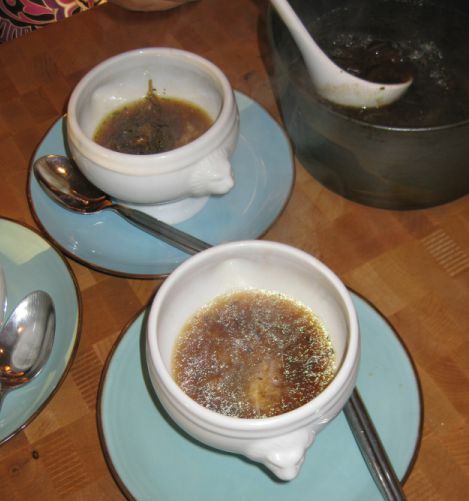 The container/ramekin holding the soup is often finished by being placed under a broiler and traditionally with croutons and gruyère melted on top. 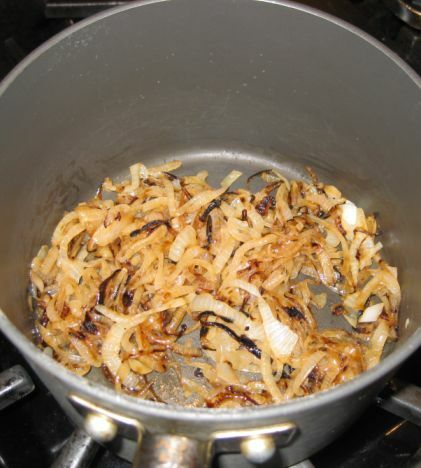 The caramelized onions are the most important thing while cooking this soup. 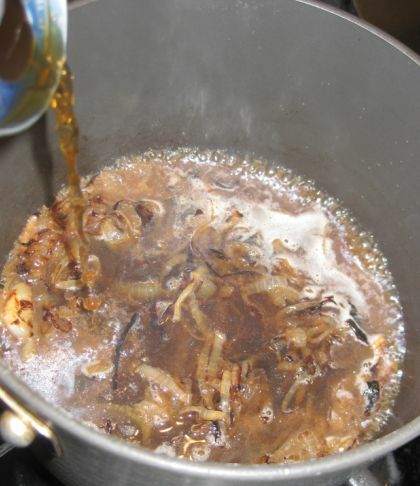 The caramelized onion bring out the complex flavors and in the final stages of cooking cognac is used to enhance the caramelized onion flavor and deglaze the pan. 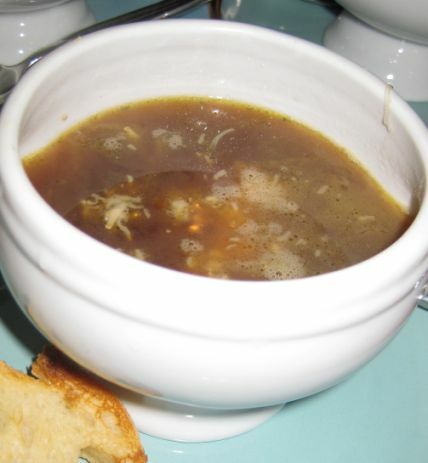 This is the traditional way of serving onion soup with thick slices of French bread that are toasted in the oven and placed on top of each bowl then sprinkled with cheese. 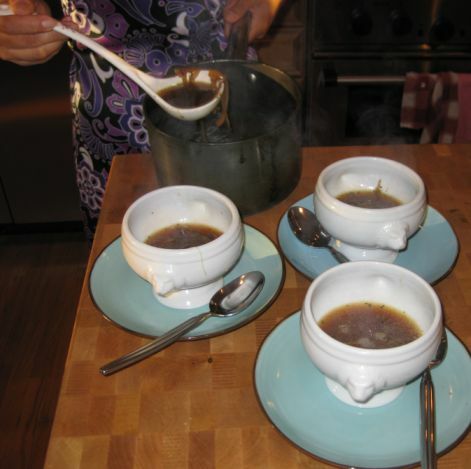 The bow is then put back in the broiler so that the cheese is melting on top. 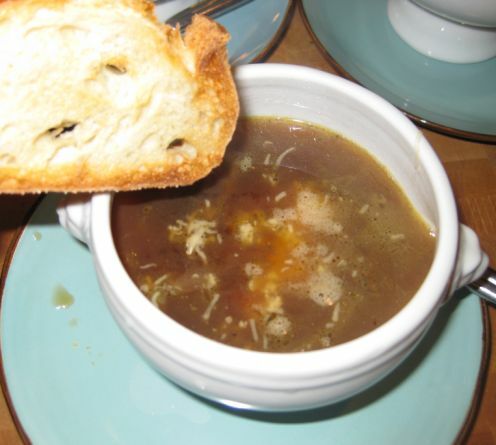 In the spirit of eating light I purposely omit to insert a toast inside the bowl and I rather eat my bread crunchy. 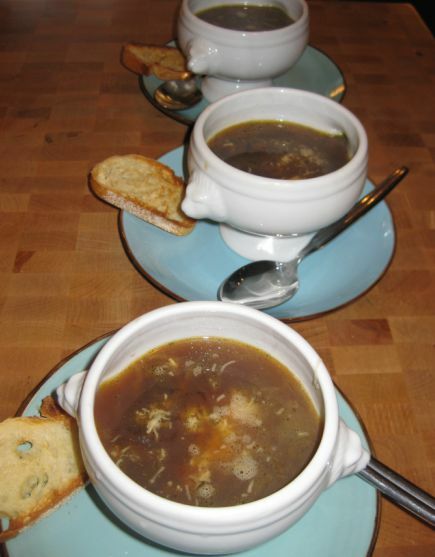 Close up look at the onion soup. 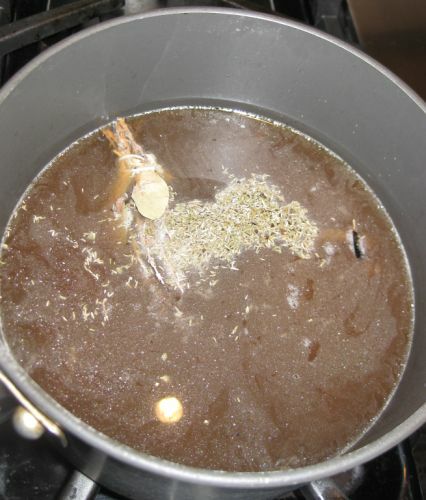 Next beef broth is added to the pot and then brought to a boil. 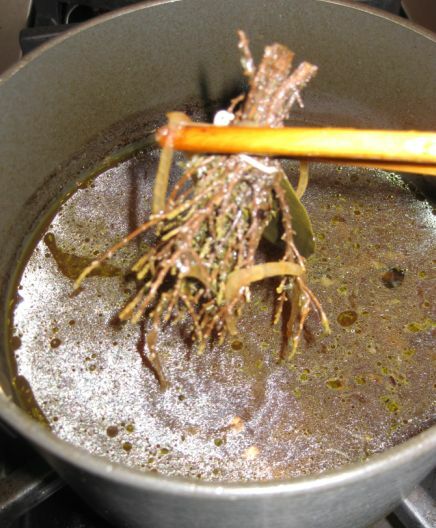 Once it is ready, the bouquet garni is removed from the broth. 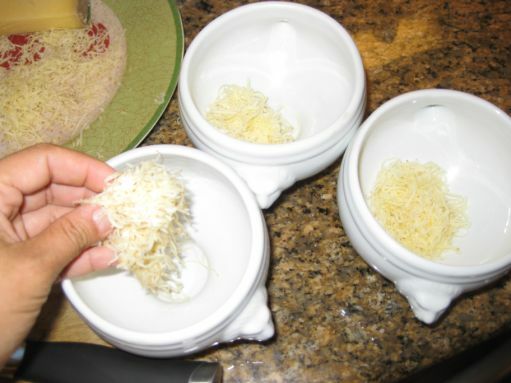 Adding shredded gruyère in the bottom of the bowl. 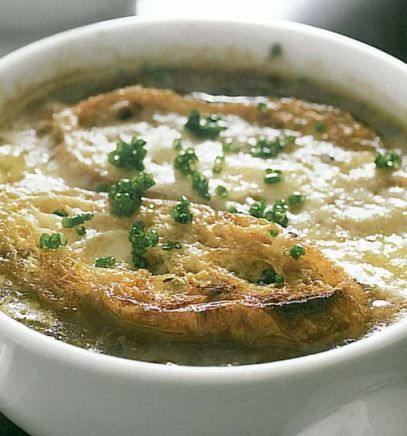 Spooning the soup inside the soup. 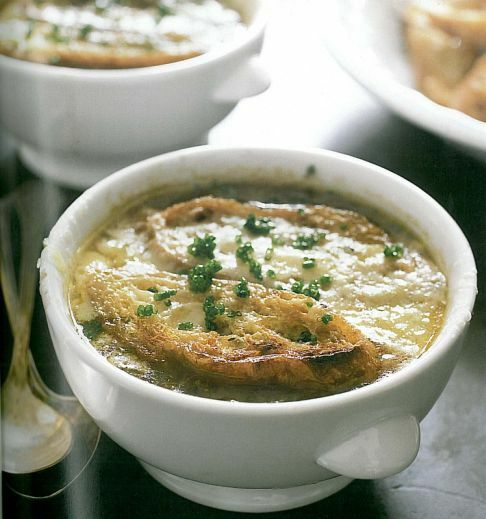 The hot soup will melt the cheese and makes it oozy. Putting the final touch... A piece of toast and gruyère will go on top of the bowl and then will be put under the broil until the cheese is melted and gooey.